I have just completed my series on organizing ideas and I found it hugely inspirational. And, as you will soon discover through a little photo essay, I am in need of inspiration! I am regarded by many who know me well to be very organized, in fact, almost too organized. I am here to prove them wrong and to bare my closets! Today I took a few quick snapshots of how things currently stand in several of my closets. There is no doubt they are in dire need of intervention and this series of posts was designed to prep me for the task. First, my bedroom closet. Keep in mind my home is truly a unique place, filled with angles and nooks and crannies. 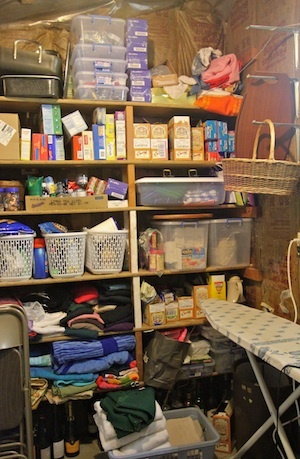 I do not have spaces that California Closet solutions can be considered! I expect many of you have the same type of space limitations. 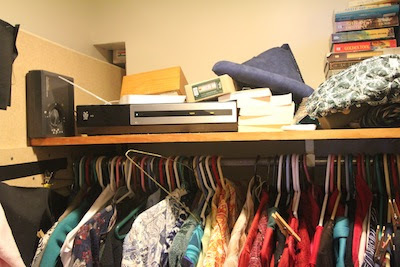 My bedroom closet is a small walk-in closet that I share with my husband. Here is a photo of my side. 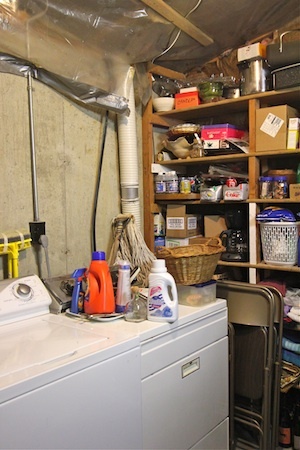 The top shelf is poorly organized (meaning not organized at all) and totally under used. Some construction needs to happen here to make this space more functional. 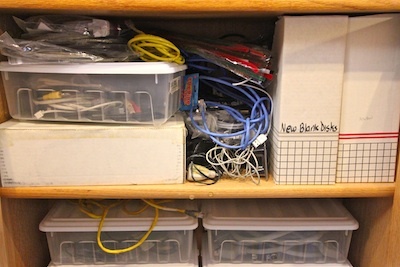 Move on to the computer cable supply cabinet. Here you can see a previous attempt at organization but it has gone awry, probably because it has received no attention since floppy disks. See that container for new blank disks? How long has it been since you've used a floppy disk? This cabinet shouldn't be too difficult to bring under control. Much of what is here is outdated and can be tossed and I can use some of the cord control hints I shared to help manage what remains. 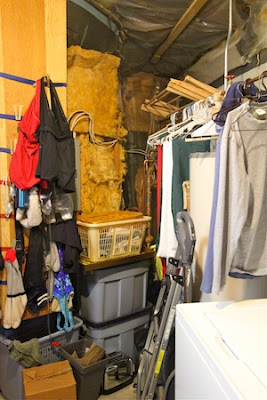 The hall utility closet will be more of a challenge because we use and regularly access so much of what is in here. Again you can see earlier organizational schemes with the peg board. Some good containers should help curb much of the disarray in here. And then the huge project this year (I sincerely hope) will be my laundry room/pantry. This room was never finished due to limited funds 35 years ago when we built on shoestring. Once moved in, the task of moving out to finish it was just too overwhelming but this is the year. I won't be tackling this one alone but will do the contracting for it. It will require skilled tradesmen because I need to move the water heater, pressure tank and plumbing plus change plumbing and electrical. It will require framing, new insulation and flooring. And then I have to decide if I want open or closed cabinets. It is a huge job that I have been thinking about for years. Many decision yet to be made. As you can see, I have a busy year planned. My blog series on organization has gotten me into the correct mindset. 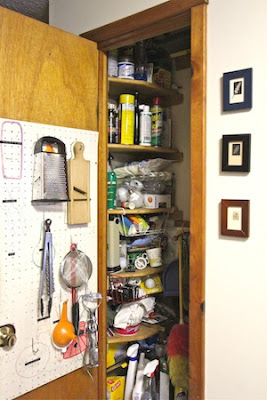 I hope it has provided you with the inspiration to tackle an organizational issue in your home as well. Share with me your stories, closets and solutions!